One year ago today I started running regularly—the first time as an adult that I’ve maintained a consistent exercise routine (one prior attempt in 2009, with fatherhood looming, lasted about a month until I was overtaken by new dad sleeplessness). In twelve months I’ve run 450.7 miles, for an average of about 9 miles/week. I had been on pace to beat 500 miles until the dregs of New York’s winter set in; I don’t mind the cold—I ran through December (actually my best month at~60 miles logged), January, and half of February—but then slipped into a six-week hiatus when the really gross, wet, and icy weather set in. This year I’m hoping to get my weekly average closer to 12-15 miles by reintroducing distance runs, and upping routine runs from 5k to 4m, which should put me well over 500 miles twelve months from now. Don’t cheap out on sneakers! I waited way too long to upgrade my ancient running shoes, but when I did it had a huge impact on my gait, leading to less fatigue and fewer injuries. You should absolutely visit a local Running Company or similar, where their staff will put you on a treadmill, watch you run, and recommend the best shoes for your specific needs. Break up the monotony however you can. 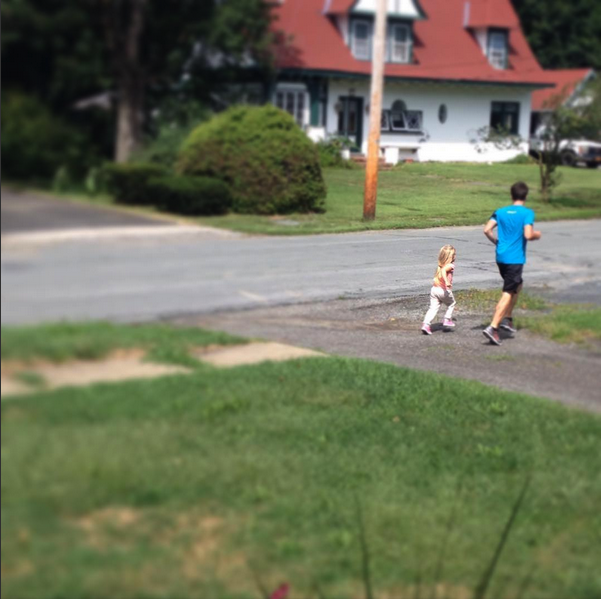 I usually prefer to run alone, but will occasionally bring the dog out for the first mile (or recently, my four year old) just to mix things up. Stick to your schedule. If you’re traveling, or tired/hungover/whatever, get out there anyway…even if you walk a bunch and kill your pace stat, it will help keep you mentally checked-in. For me anyway, skipping one day often turns into two, or three, or…a lot more. A few months ago I started running. I was a bit overweight and generally feeling sluggish and creaky after a summer/lifetime of being pretty sedentary. So I put on the sneakers I bought last time I tried to pick up running regularly and…just started doing it, lest I overthink it and wind up on the couch researching all the exercise gear I need and whoops, I’m back where I started. This was a personal record for distance and time—the weather was crummy, otherwise I think my pace could have been a bit quicker. I’ve run almost 200 miles since that first run and have lost 17 pounds, hitting my (admittedly arbitrary) goal weight exactly three months from when I started. Three months ago the idea of running for an hour without stopping felt impossible. The human body is a crazy, remarkably adaptable machine.